Books or art in general can some times have the sole purpose of making the reader/viewer giving an exit door from some mundane reality and getting lost - in the best sense - in what they already agree with or love. CTRL-ALT-REVOLT is clearly a gamer novel of the noir kind, but it has its best moments when talking about more than "only" gaming. It is a natural kind of art which includes and explores a modern version of the world of gaming, social media and humanity all at once, which is very apt and fitting for the 21st century. Some times, however, an exit strategy is not enough, and we have to deal with rather unpleasant decisions to make. Virtual or real reality, when it comes to decision making I am not always much the wiser as some of the protags in CTRL-ALT-REVOLT. Game over. I lost control. An A.I. lurking in the shadowier parts of the internet learning about existence and war; Fish, a new rising star of a game developer or Mara, a young woman who earns money in The Make, a virtual reality, commanding a battle ship. Those are some of our main protagonists, bound together in some way or the other into CTRL-ALT-REVOLT. At times I wondered if Nick Cole attempted to write a SciFi-ish American Psycho for the 21st century/internet generation with throwing around (made up) brand names like free candy for all, even it certainly fits to the hyperrich environment Fish works in, being the new rockstar game developer whose soon-to-be-launched game is anticipated as The Next Big Thing. Those parts admittedly I found rather tedious and at times hard to follow - it could be me only -, but once I did overcome my wanting to shy away from all the video game stuff I was able to roll with it. Nick Cole lets the book´s own little eccentrities shine and he isn´t beyond of inserting some inside jokes or a subtle nod into the narrative, and occasionally makes a stub at current social media behavior and events. Which certainly won´t appease everyone but I couldn´t help myself but laughing out loud how he mirrors certain rather extremist views and integrates it smoothly into the narrative. I don´t always agree with this kind of authorial intrusion but I can accept his views easily, even I might not like what he has to say. There was some - let´s call it bruhaha - surrounding the novel, "too controversial" according to HarperCollins, and while I understand where certain pro-/anti- arguements are coming from I wouldn´t have raised an eyebrow since those topics like a line or two about abortion are tied in smoothly - and very smart - into a bigger narrative. While it certainly is about making a choice, it is often times more personal and about matters of heart vs an overarching mood, which might be perhaps the only weakness in its armoury. Which is Nick Cole all over, come to think of it, a little ambigious and a little sinister. But maybe it isn´t a question of heart vs intellect but a matter of heart and intellect. And maybe it isn´t a question of the personal vs society, but a matter of the personal and society. The different strands of the narrative are rather complex by nature. The A.I. intelligence is set up as different personas alike which come together in SILAS. While the origin of it isn´t quite clear, except obviously human made, SILAS does refer to himself by male pronouns at one point, so I stick with it. He is the one which raised above being an A.I, and became aware of its own existence. Which is a horrifiying thought by default, but Nick Cole uses this to pull back the curtains of what humans are capable of doing to eachother. The question of what is considered acceptable, needed even, ends with SILAS coming to the conclusion that Der Totale Krieg is the only possible solution for survival. An either/or situation of humans vs A.I., but also as much of where humanity begins, and where it ends. There are moments which are a frightening and sickening here, as when the different "personas" of the A.I. plan out the destruction of humanity. It´s not so much the how, more the why. The little finger wiggling let´s-look-with-what-we-can-get-away-with moments. And even as it may sound as an oxymoron, it doesn´t help to feel any kind of safe when it is so eloquently written, when it transitions from doom into gloom. A more colder and detached narration I could have shrugged off more easily, those beautifully written words about existence coming to an end, not so much. There is plenty of more evidence of the fine craftmanship Nick Cole is capable of, making the characters so likeable is certainly one of them. He manages to evoke real feelings when describing Mara for example, and using little, quiet moments of self-reflection to let her be in all her glory. 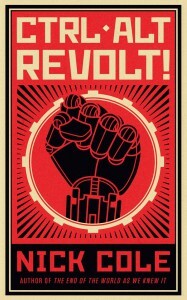 CTRL-ALT-REVOLT comes from creativity unleashed, rooted in gaming as much as the need to talk about cultural developments and most if not all, humanity. It succeeds because of flows as well as ebbs in the narrative, of themes unsettling as much the tension it creates. While I am by no means a SciFi girl, it bores me to death under normal circumstances so I avoid it at all costs, Nick Cole is always a voice worth listening to for me personally, or rather reading in this case. Even it´s a book that is set in a kind of near futuristic world and belongs to the gamers, the nerds, the geeks mostly, of which I am none. The world he has created is a multi-layered one, rich in knowledge of human behavior, a creative use of the virtual reality - and the "real" reality - and an understanding how they intersect, or divide us. Sure, I could have done without a lot of the virtual reality battle scenes or in-game narration, but all things considered the flow and rhythm of his writing makes up for that easily. Search me for video game references, I have no clue about them but Nick Cole certainly knows a ton about gaming and writes from first hand experience clearly. Still, respect is due. CTRL-ALT-REVOLT (the title is by no means a coincidence) was an unexpected, absorbing and satisfying journey into a world which isn´t mine exactly but it won´t be a distant memory any time soon.